Powder hound — pointed and going. Two inches per hour. That’s how fast the snow’s falling outside. Enough snow that, if you add serious wind, you officially have a blizzard. Luckily, the winds are moderate; the storm that my brother-in-law, Caleb, and I are driving through is the kind that sends some people straight home and others straight to the mountains. We fall into the latter group. 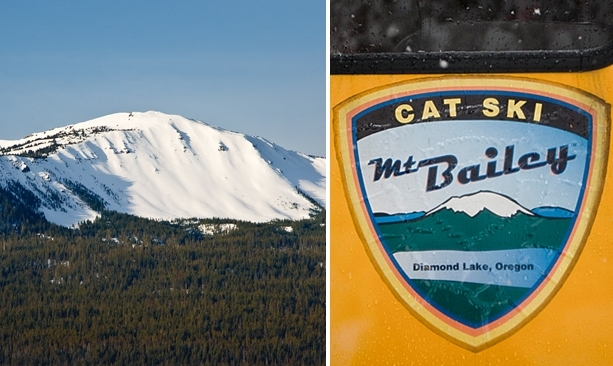 We’re going skiing — more precisely, cat skiing on Oregon’s Mt. Bailey. Perched in the Cascade Range near Crater Lake, Mt. Bailey is home to more than 6,000 acres of skiable backcountry terrain: glades, bowls, steep chutes and everything in between. It also boasts an impressive average yearly snowfall of 600 inches, virtually guaranteeing that you’ll find snow throughout the season. What Mt. Bailey doesn’t have are ski lifts. 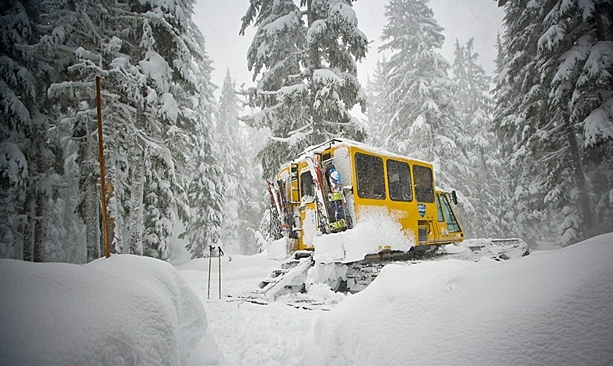 So, if you want to access its bounty, you need to be prepared to hike for it or ride the snow cat “taxi” offered by Cat Ski Mt. Bailey. Run out of the rustically classic Diamond Lake Lodge, Cat Ski Mt. Bailey has been ferrying powder hounds into the backcountry since 1977. 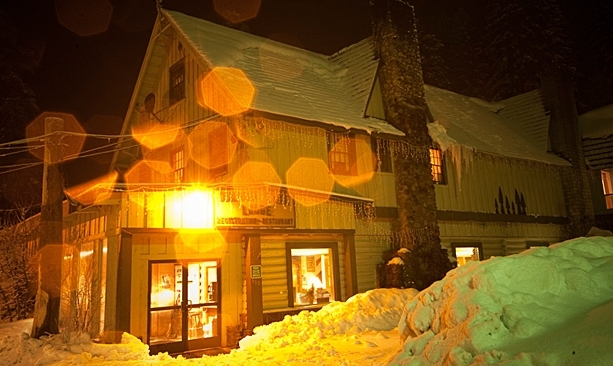 Diamond Lake Lodge may not be as well-known as its cousin to the north, Timberline Lodge, but its location on the shores of the alpine Diamond Lake is no less awesome. 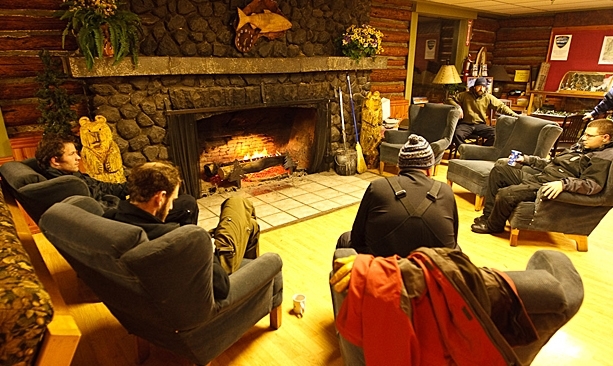 The lodge is cozy and welcoming, and the rooms are no-nonsense and tidy. Caleb and I arrive tired, but excited. The morning of our excursion, we sip coffee and feel the buzz of the others who’ll join us in the cat. It’s been snowing steadily all night, and higher up on Mt. Bailey, it’s been dumping. Everyone is fired up about the day, curious to see what the conditions hold, and ready to get after it. Riding in a snow cat is comfortable, but it’s a little slow. Fortunately, good company helps make the 12-mph trip uphill go a bit faster — and the fact that there are almost 40 inches of new snow on the mountain basically erases any boredom. Once we’re on the top, we unload, get our skis on, and drop into an open bowl for the first turns of the day. 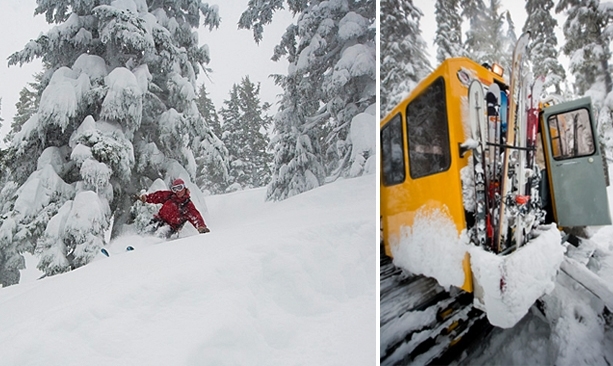 It’s hard to describe powder skiing to someone who hasn’t experienced it. It’s a feeling people spend their lives chasing, sometimes to the tune of global travel and serious cash (heli-skiing anyone?). Here on the flanks of Mt. Bailey, I am reminded why. The snow spills over the tops of my boots and up to my knees — and I’m tall. One by one we drop through the bowl, arcing turns and hugging the trees along either side for some perspective amid the low visibility. We stop with the ski guides above the first steep pitch in the trees. With the amount of snow that’s fallen, they’re not taking chances on the steeper, more exposed slopes. But even among the trees, there’s so much snow that they want to ski cut the lip above where we plan to ski. 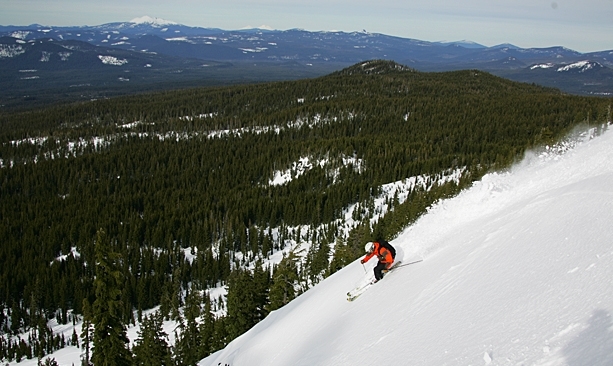 Ski cutting involves a person skiing perpendicular to the slope and letting his or her skis essentially trigger any snow that was waiting to release as an avalanche. 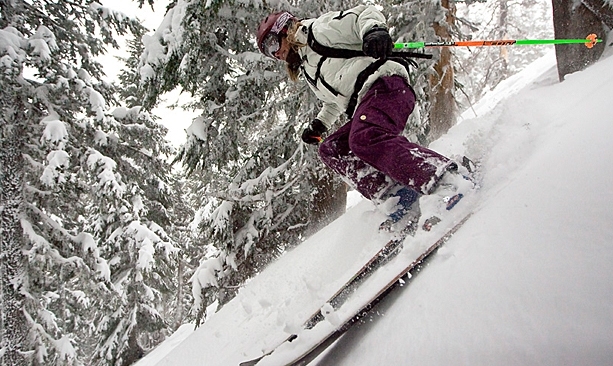 It’s standard ski patrol work, and a good way to control limited areas that are at risk. After the preventive measures, we pick cautious lines through the lower-angled slopes and the trees. It’s easy to lose yourself in this kind of skiing: fast turns in the trees, dropping over knolls and through gullies, snow billowing up around your thighs. It’s snowing so hard, all you can hear is the wind and the sound of the person just behind you, making for a Zen-like passage through the white and green landscape. For the rest of the day the cycle is simple: Ski, ride cat, repeat. After a few trips, we return to our first run, and it’s difficult to tell we were ever there. Our tracks have been almost completely filled in by the storm. 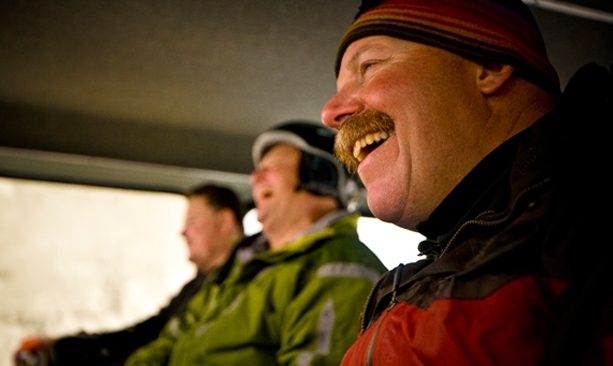 When it’s time to call it a day, everyone is wearing the look of a satisfied skier: tired joy. Back at the lodge, there’s talk of the day and of future trips. Those who’ve never been here before are hooked, and vow to return. Those for whom this is a repeat performance smile, knowing the feeling of tapping into something good — an incredible setting, great people and the near-indescribable rush of real powder skiing.